Here comes the latest news regarding to YouTube service to Nigerians. 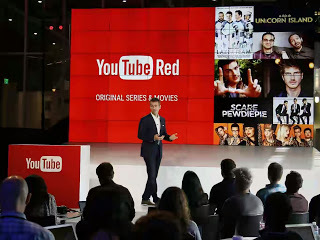 Now, for those new or hearing of YouTube Red for the first time, it is a paid-for subscription service that gives you the opportunity to access many features while on YouTube. Some of the features are as follows: Enables you to watch videos online while on YouTube without ads running on the video, ability to download any type of video you like, you can as well play videos in the background and same time do other things with your phone, and also offers you access to original contents. Not so long, Netflix brought their service to Nigeria, now Google has joined in bringing YouTube Red too. As long as Nigeria the giant of Africa is concerned, any online business firm that is not working with it, I bet, that online business is missing a lot. This YouTube Red brought to the court of Nigerians, gives everyone in Nigeria the opportunity to try it out for a lasting period of 3 months and it is billed at 99¢ as opposed to a monthly fee of $9.99. Hence, for you to get YouTube Red without a discount, you will have to pay $10 per monthly for the subscription. Time for you to try it out. Share to let friends know about this YouTube Red from Google.